BMW i8 | What Car? 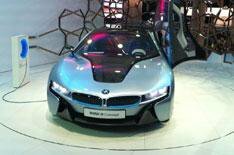 BMW's i8 hybrid sportscar promises to be faster than an M3 yet can average over 100 miles per gallon. The two-plus-two seat coupe is powered by a three-cylinder 217bhp petrol engine that combines with 96Kw electric motor. Total output is 349bhp. That means the i8 concept car can go from 0-62mph in just 4.6 seconds (0.3 seconds faster than an M3) and on to a limited top speed of 155mph. Its average fuel consumption is 104mpg and it emits just 66g/km of carbon dioxide. The batteries take less than two hours to completely recharge. The i8's plug-in hybrid system has the petrol engine driving the rear wheels, while the electric motor drives the front. The car can run on electric power alone for up to 20 miles. BMW says when the two are used in tandem it will provide an 'unparalleled driving experience'. The i8 also has an intelligent navigation system, where the vehicle calculates the best way to manage the energy consumption of the two power units along the route to its destination. On different sections of the route, the vehicle characteristics can be modified so that the drive units are managed either for maximum efficency or for optimal performance. Based on the Vision Efficient Dynamics concept car first displayed at the Frankfurt motor show in 2009, the i8 is scheduled to go on sale in 2014.